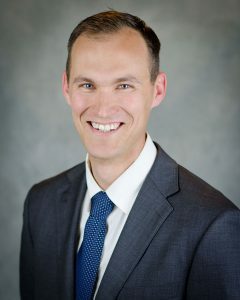 The Most Reverend Robert D. Gruss, Bishop of Rapid City, and the Most Reverend Paul J. Swain, Bishop of Sioux Falls are pleased to announce the appointment of Christopher Motz as the first executive director for the South Dakota Catholic Conference. This newly created Conference will serve as the official voice of the bishops of South Dakota on issues of public policy, providing explanations of Church teaching and their practical application. Mr. Motz is currently the owner and managing attorney of Motz and Motz in Isanti, MN. Originally from Sioux Falls, he graduated from O’Gorman High School, Iowa State University and University of St. Thomas School of Law. He served in the United States Marine Corps including on active duty in Iraq. He is currently a Staff Judge Advocate in the Minnesota Air National Guard. A state Catholic conference, which most states have established including those in our neighboring states of North Dakota, Minnesota, Iowa, Nebraska and Montana, monitors, responds to and educates Catholics about proposed public policies of all levels of government. Especially important are those that impact the life and the dignity of all persons and the rights of Catholics to practice their faith both personally and in the public square. As the executive director, Mr. Motz will follow the development and implementation of public policies and communicate with public officials in all branches and at all levels of governments not only during a legislative session but throughout the year. He also will serve as a resource for clergy as well as diocesan and parish staffs. Additionally, he will focus on issues that are of common concern among Catholic organizations, other faith-based communities, and secular agencies to promote religious liberty and the common good. Mr. Motz and his wife Hannah have three children and will be relocating to South Dakota. He will begin his duties as the executive director of the South Dakota Catholic Conference in October.